The RPS commissioned Beethoven’s Ninth Symphony for the sum of £50 and gave the first performance in the UK on 25 March 1825 at its concert hall in Regent Street, London. Two years later, when Beethoven was on his deathbed, the Society sent him £100. Beethoven received this gratefully, expressing his thanks to ‘the Society and to the whole English nation’. Schaller’s iconic bust of Beethoven was given to the RPS (then the Philharmonic Society) in 1870 by Fanny Linzbauer in recognition of its generosity towards the composer in times of need. It was displayed on the concert platform of every Society concert thereafter; a tradition which has been re-established this year as part of the RPS Bicentenary celebrations. Earlier today, our Beethoven Bust took time out of his hectic travelling schedule to update RPS Admin Assistant, Helen Pearce, on his news. Helen: Beethoven Bust, thank you for finding the time to chat. I hear it’s been a busy year for you. Beethoven Bust: It has indeed! I’ve been appearing at concerts all over the country! I’m just back from the Aldeburgh Festival and am looking forward to a few days tanning in the sun; I’ve been looking a bit pale recently. Helen: I’m glad you’re finding a moment to put your (figurative) feet up amidst the RPS200 celebrations. Helen: Well I spend so much time lugging you around, it seemed only right to get to know a bit more about the man behind the stony exterior. Give us a smile! Bryn Terfel drops in to say hello. Beethoven Bust: I’m actually made of plaster. I’m a replica of the bust that was given to the Society and I was placed on the platform of every Philharmonic Society concert from 1871 onwards. I did have a brief spell of retirement though, after the last concert series was given in the 1980s. Helen: You’re looking very good considering you’re over 100. 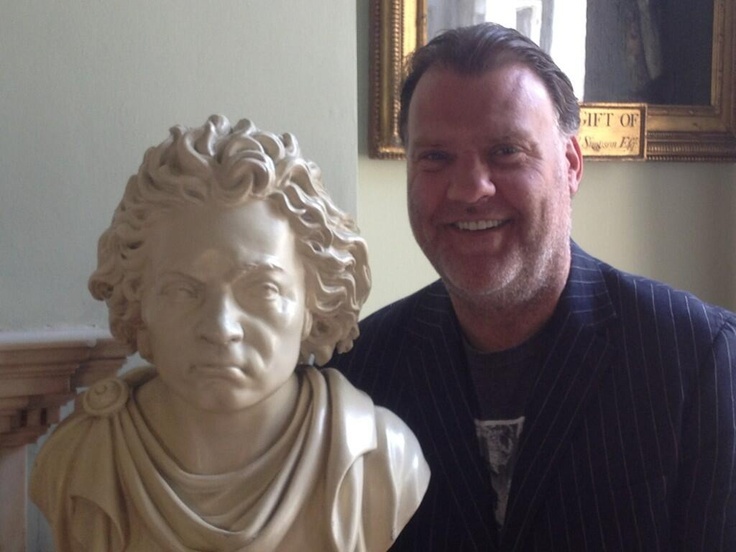 Beethoven Bust: Well I need to stay in shape; people keep wanting to have their photo taken with me. Just the other day that lovely Bryn Terfel dropped by to say hello, and I was spoilt rotten by the Classic FM when I visited their studios. Don’t believe me? You’d better take a look at my Pinterest page. Helen: You have a Pinterest page? Next you’ll be telling me you’re on Facebook too. Beethoven Bust: Facebook?! That’s so last century. It’s all about Twitter these days. My @beethoven_bust account already has quite a following. Helen: So when you’ve had your fill of tanning and tweeting, what’s next on the agenda? Beethoven Bust: Speak up! I’m a little deaf. What’s that you’re suggesting? A bender? What would be the point of that? I’m already plastered. The RPS’s free Birthday Prom will feature the Society’s most famous commission, Beethoven’s Ninth Symphony, and a new work, Frieze, from British composer Mark-Anthony Turnage co-commissioned the RPS, BBC and New York Philharmonic. The concert will be broadcast live on BBC Radio 3. For more information, please visit the BBC Proms website. Is Beethoven Bust coming to a venue near you? Take a look at all the concerts and events we have planned for the second half of 2013 in our online brochure. 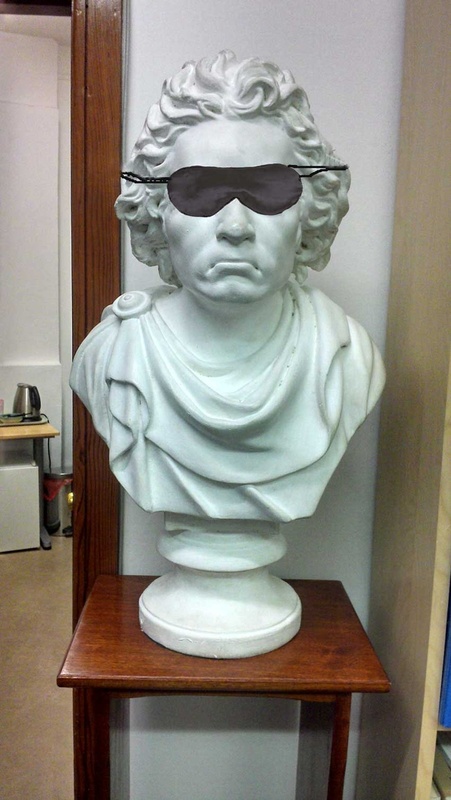 You can read more about the Beethoven Bust -and avoid the awful puns – on our website.